When the prototype Sud Aviation SE3130 Alouette II helicopter made its first flight in 1955, it became the first turbine powered helicopter to enter production. 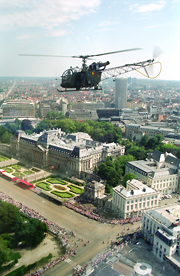 The Alouette II, together with the Alouette III and Lama, have played an important role in the development of the international rotary wing industry. This website is dedicated to the thousands of people who have designed, built, maintained and flown these remarkable helicopters in more than 100 countries. Pierre Gillard has been collecting everything related to the Alouette and Lama for more than 30 years and this website was established in 2001 to share some of these documents, photographs and articles. Mr. Gillard is an Avionics Engineer and Professor at the École nationale d'aérotechnique in Saint-Hubert, Quebec, Canada. He also holds a Commercial Helicopter Pilot License and is a Transport Canada licensed Aircraft Maintenance Engineer (AME). He would like to correspond with anyone who shares his passion for the Alouette and Lama. Addition of a picture of Star Work Sky's F-GDQR Alouette II at Strevi, Italy. Addition of a picture of F-HBFJ Alouette II at Strevi, Italy. Update of Alouette II MSN 2151 history. Update of Alouette II MSN 2262 history. Addition of pictures of C-FHCL Alouette II in Canada. Addition of a picture of Hydro-Québec's C-FZHM Alouette II in Canada. Addition of pictures of Duverney Hélicoptères' N318DH Alouette II in France. Addition of Alouette II MSN 2059 history. Update of Alouette II MSN 2163 history. Addition of Alouette II MSN 2243 history. Addition of a page about "Castaway" movie. Addition of a page about "La Fille de l'air" movie. Addition of a page about "Le Gendarme en balade" movie. Addition of a page about "On a volé la cuisse de Jupiter" movie. Update of "Starring Alouettes and Lamas" page. Update of Alouette II MSN 1087 history. Update of Alouette II MSN 2352 history. All Updates - Latest News - Blog. YOU AND THE ALOUETTES ! © Pierre GILLARD - Last update : 23-03-2019. The use of Firefox or Safari browsers is recommended and a 1024 pixel-wide screen is advised.